The human body’s health depends on a steady circulation of blood. A local community’s economic health depends on a steady circulation and recirculation of the same cash. If that blood leaves the community, the city suffers. That’s what The New Economics Foundation’s researcher and author, David Boyle, said in a TIME Magazine piece on how buying local boosts an economy. David says that money spent locally, instead of at big box retailers, online, and non-local services, is the difference between a thriving community and ghost towns or clone towns. The lifeblood of a community stays or leaves based on where consumers spend. The research group CivicEconomics.com has run 15 studies of 17 US cities over the past 10 years, to bring us these staggering statistics on how your money recirculates in your community. 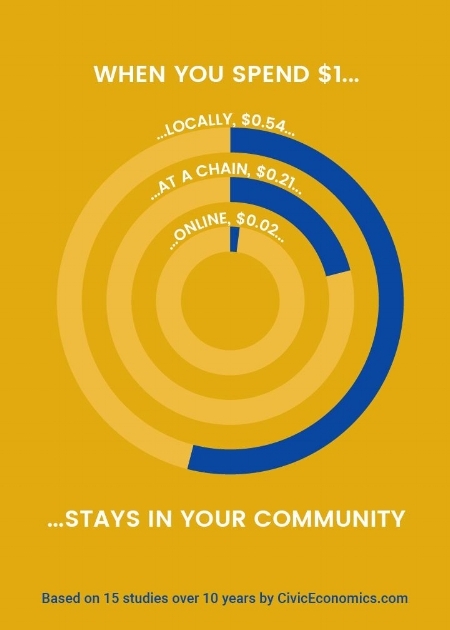 In short: spending local means the majority of your dollar is reinvested locally, but spending online or at a national chain ensures the profits leave your community never to return. 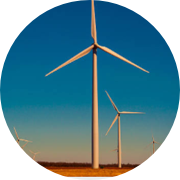 Our goal is to make it easier to support your town without having to compromise on convenience or prices. Our favorite local business owners shouldn't have to hang up their hats just because folks don't know about them. We want to band together with locals to make our hometowns prosper. HOW DO I HELP SUPPORT LOCAL BUSINESSES? Think twice about every purchase! Spend an extra 15 seconds looking for local choices – they're almost always available. If you're in one of the cities Towny supports, then you can have hundreds of only local businesses at your fingertips by downloading the free Towny app. Have you ever seen a "support local" movement bumper sticker and felt "yes, that's good"? We have. What tangible actions can you take to support local? It turns out most people have a vague idea, but aren't sure what to do. So Don Shafer, our Founder, with a lifetime of service to local banks and credit unions nationwide, decided to start Towny with a simple idea: help people take tangible actions to support local. "Let's connect consumers in a city with their local business community" we said, and haven't looked back. Three years later, we're supporting four cities and have plans to go into another 250 over the next couple years. Most consumers don't think twice about buying local or not because they don't know what's available. When working in Lubbock, for example, we identified over a thousand local businesses — but most consumers estimate there are only a hundred or so. Your town probably offers a lot more than you knew! The problem is, most businesses doin't have a mobile presence or the resources to comminucate with you. So why not form a coalition of local businesses, banks, and charities, whose pooled resources could give a voice loud enough to be heard? That's what we've decided to try. And it's working! Buy, bank, and give local. 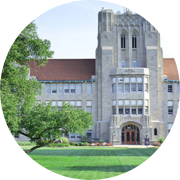 That's our mission because those are the three pillars of a community that can work together to form a coalition that entices and attracts you — the consumers — to participate in the local community. That's the center of local flavor. When a favorite shop closes, it's usually from inability to compete with the big company marketing. Even 5-start rated businesses close all the time simply because enough people don't know about them! Did you know that local banks offer the same services as a national chain? Well when they hold the money, they invest it in local businesses and ideas — it's like crowdsourcing focused on your town. You're supporting local innovation if you bank local. Your community only gets better when you participate in helping it help itself. Towny helps you by bringing rewards and campaigns in your town to the doorsteps of your local charities, helping you get involved too! Towny has decided to unite these three forces town by town, across America. See you there! Local coalitions in our pilot project cities have already put thousands of deals online in our mobile app. Download it to get rewarded for going local.